Recognised by Guinness World Records as the world's largest music festival for the past 15 consecutive years, Milwaukee's Summerfest truly knows how to throw a party. Serving up a smorgasbord of brats, brews and bands – over 700 national and regional acts performing on 11 stages – this year's "Big Gig" at Henry W. Maier Festival Park on the city's Lake Michigan shoreline drew more than 840,000 visitors over its 11-day run in late June and early July. 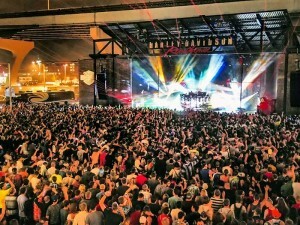 To handle audio production duties for this year's 46th annual bash, Milwaukee World Festival, the non-profit organization that runs the event, once again turned to local provider Clearwing Productions, which specified the use of more than 340 L-Acoustics loudspeaker enclosures for FOH throughout the grounds. According to Bryan Baumgardner, Clearwing audio operations/logistics manager, eight of Summerfest's nine largest stages – including the 25,000-capacity Marcus Amphitheater – featured L-Acoustics systems. Five of those stages – the Marcus, as well as Briggs & Stratton Big Backyard, Harley-Davidson Roadhouse, BMO Harris Pavilion (formerly Classic Rock Stage) and U.S. Cellular Connection – utilised K1 for the primary house arrays. Additionally, the system for the Johnson Controls World Sound Stage (formerly Potawatomi Stage) was built around Kara, while Uline Warehouse featured V-DOSC. A new addition to Summerfest's gear list this year was the use of L-Acoustics' ARCS Wifo enclosures. At Jo Jo's Martini Lounge, Clearwing vertically flew one ARCS Focus over two ARCS Wide per side, which replaced two six-enclosure Kiva arrays used in years prior. ARCS Wide systems were also used on half of the stages for both front-fill and side-fill. "We previously used standard ARCS boxes, but ARCS Wide has a larger dispersion pattern that makes it particularly ideal for side-fill," says Baumgardner, "Plus the power rating is better suited for front-fill applications. They worked perfectly and everyone was really happy with them." He adds that Clearwing has been providing audio for the festival since 1995 and first began deploying V-DOSC there back in 2000, shortly after acquiring its first rig. Since then, L-Acoustics has been on the equipment spec every year. "One of the primary reasons we use L-Acoustics is because of its high rider acceptability; nobody says 'no' to K1, Kara, Kudo or V-DOSC," says Baumgardner. "We've been using these systems at Summerfest for a long time now and they consistently prove themselves to be the right choice year after year. It's what the festival wants as well as what the artists want. We don't have to convince anyone to use it." Less than two weeks after the close of Summerfest, Clearwing supplied 80 K1, 32 K1-SB and numerous other L-Acoustics enclosures for a huge Pearl Jam concert at Chicago's Wrigley Field. A portion of Clearwing's L-Acoustics inventory is also regularly being used at Maier Park this summer for a number of ethnic festivals, including Polish Fest, Festa Italiana, German Fest, African World Festival, Irish Fest, Mexican Fiesta, Indian Summer, Asian Moon Festival, Arab World Fest and PrideFest. Over Labor Day weekend, the Summerfest grounds will once again be packed as Clearwing provides concert systems for Harley-Davidson's 110th anniversary featuring performances from Toby Keith, Aerosmith, Kid Rock, ZZ Top, Dropkick Murphys, Lupe Fiasco, Common, Brantley Gilbert, Doobie Brothers, Buckcherry, Joan Jett & the Blackhearts, Gaslight Anthem and Sublime, among others. For more information on Summerfest, visit www.summerfest.com. Clearwing Productions can also be found online at www.clearwing.com. L-Acoustics is a leading innovator and manufacturer of high-performance loudspeakers, amplifiers and signal processing devices for touring and installed sound markets. Known around the globe for pioneering and championing the modern line array loudspeaker concept with V-DOSC, the company has received numerous accolades for its K1, Kudo, Kara, Kiva, ARCS, XT coaxial loudspeaker systems and SB line of subwoofer enclosures, all powered and processed with the LA4 and LA8 amplified controllers in fulfillment of a "total system approach." Product distribution and customer service for the USA is handled by L-Acoustics' subsidiary in Oxnard, California.